Peter Hofschroer is a whistleblower who has been denied due process to hide a crime network involving the North Yorkshire Police and York Social Services. 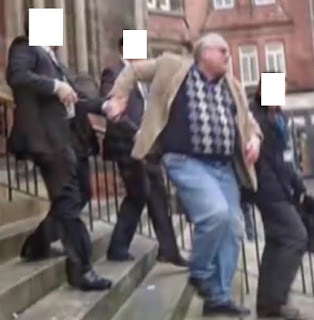 above: Peter H. being taken away from a bogus court hearing in York on Dec. 4 2014 he was lured to – he was been in custody ever since [except for a couple of weeks]. He is at present in HMP Preston now awaiting the extradition hearing to send him back to Austria. This is an URGENT APPEAL for us all to unite at the Royal Courts of Justice in London, UK, on Wednesday 14 June, 2017 to show our support for a well-loved British man, military historian and author, Peter Hofschroer. Friends and supporters of the acclaimed author and historian and his mother, Barbara (aka Grandma B), are asked to attend his appeal against extradition to Austria. He has been unlawfully sectioned under mental health legislation in Austria by a single judge who has never met him, and WITHOUT A MEDICAL EXAMINATION. They want to incarcerate him forever in a mental institution and force him to take psychiatric drugs because he has been speaking out publicly about public corruption in York and North Yorkshire (place that he refers to as “Savile Country”), and other places. 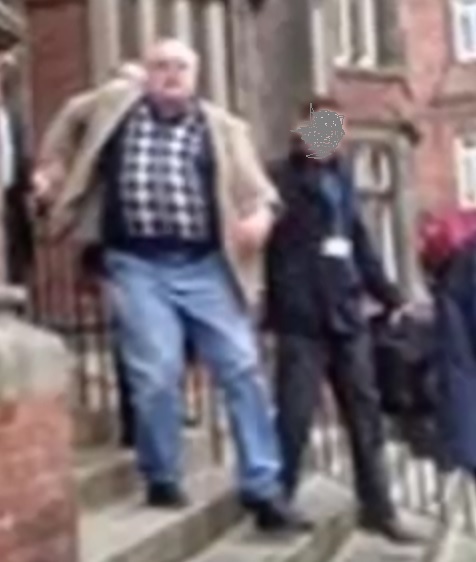 Please see details here: http://www.grandmabarbara.co.uk/ It is no surprise that North Yorkshire Police and the others have been desperate to silence him (at huge cost to the public purse). It also is known that his beloved 87 year old, wheelchair-bound Mum is grieving for him, thanks to York Social Services and the Court of Protection. She wants desperately to be reunited with with Peter, her loving son. Please don’t let her end her days without Peter, who had been caring for her every need, 24/7, until disaster struck. She is incarcerated, against her will, in Haxby Hall, Yorkshire. She would surely enjoy cards and letters of support from you. See the Grandma B Blog: http://www.grandmabarbara.co.uk/ Please do your utmost to get AT LEAST 700 people to Royal Courts Of Justice. Use Facebook, Twitter, and everything you can to get the word out. PS: What are the maximum sentences for the terrible ‘crimes’ I have committed? What sentences will you be askng for? I understand from Counsel Adam Roxborough that the offences now charged are not imprisonable? Would you please confirm this, or otherwise, as the case may be? Norman Scarth. To the Crown Prosecution Service, Jefferson House, 27 Park Place, LEEDS LS1 2ZS. Tel: 0113 290 2700. I acknowledge receipt of your 3 letters dated 31st January 2012, two with ref 13BA06806/PW/KH, one ref. 13BA06806/PW/YL, along with 2 CDs & 68(?) pages of what PURPORTS to be ‘evidence’, in an envelope postmarked 1/2/12. It reached me on 2/2/12, just as I was leaving to surrender to bail at Leeds Magistrates’ Court in response to your most malicious prosecution (Adam Roxborough, the free lance barrister representing you, tried to blame the late delivery on the Post Office, which was outrageous). You list 16 ‘witnesses’ & ask which of them I want to give evidence in person. I will require ALL of them to give evidence in person, PLUS whichever senior police officer authorised this quite massive operation, PLUS the person who was the original complainant – claiming to be ‘alarmed & distressed‘! I note that seven of the ‘witnesses’ are PCs, & one is a PS. I would like to know the occupation & home addresses of the other eight ‘witnesses’. You also ask me to say ‘what issues in the case makes it necessary’ (for them to give evidence in person). That is a quite ridiculous question. The answer is self evident. I also make a request for information, but NOT with the ridiculous rigmarole of a ‘Freedom of Information Request’. They are simple questions, & I would be grateful for simple answers. (a) How many CPS man/hours have been spent on this case so far? (b) What has been the cost so far? (c) What is the estimated cost in time & transport of transporting the prosecution team & all the witnesses to Manchester Magistrates’ Court? Knowing only too well of the corruption which is rampant in our courts, there is a possibility that I may be found guilty. That possibility is a certainty if it is before a lawyer masquerading as a magistrate. With that possibility/certainty, I ask question (d) What is the estimated cost to the taxpayer if/when the case is taken to appeal in the Crown Court, the Appeal Court, the Supreme Court & an Application made to the European Court of Human Rights? Sincerely, Norman Scarth. “Adoption is easier than you think” is a poster you can see in this North London Borough that has turned child snatching into a business. Everybody profits, except parents and their children: social workers, lawyers, judges, property managers and foster carers. Information from Companies House shows the financial interests of everybody concerned. The mystery of Haringey’s missing ‘Girl X’ makes a mockery of the Children Act The family of a girl taken into care have not seen or heard from her for 10 months, writes Christopher Booker. Torn apart: the system of child protection is a national scandal 7:00PM BST 11 Jun 2011 The social workers of Haringey are notorious for having failed to prevent the deaths of Baby P and Victoria Climbié. But in their zeal to avoid any repetition of these tragedies, they are now at the forefront of those councils which have pushed the number of children taken into care to an all-time high. In all the cases I have been following where children have been taken from their families for what seem like dubious reasons, no single instance has been more disturbing than the plight of a 10-year-old girl seized by Haringey last year, who seems in the past 10 months to have vanished off the radar. “Girl X”, as I shall call her, was taken into care on the basis of three allegations. One turned out to be so laughably erroneous that it was soon dropped; a second was likewise dropped when medical tests completely disproved the council’ s claims. The third, highly questionable, has still not been put to any evidential test. The last time Girl X was seen by her mother was at a supervised contact session last August. Having complained of sexual abuse by her foster carer’s 19-year-old son, she asked to be given, as a birthday present, a journal with a lock in which she could record her “secret thoughts”. Since that day she has not been seen by her parents or, since the autumn, by her siblings, who are also in care. It seems she has since been interviewed by three people – an independent social worker, an independent psychiatrist and her guardian, all of whom reported that she wished to see and be reunited with her mother. What makes all this particularly disturbing is that, in several respects, it seems to defy the Children Act, which insists that councils must do all they can to encourage contact between children taken into care and their parents, who continue to share parental responsibility until a child is adopted. “The responsible authority,” says the Act, “has a duty to endeavour to promote contact” with the parents and “any relative, friend or other person connected to the child”. In particular, parents must be allowed to see medical or school reports relating to their child. The law also insists that, if children are old enough, they should be allowed to appear in court to express their wishes. None of these things has happened. Why – when even Baby P’s mother was last year allowed out of prison to enjoy supervised contact with her surviving children – has Girl X been shut away as a silent prisoner, seemingly denied her rights? What has happened to Girl X? For legal reasons, comments on this story have been disabled. · The Sanctuary for the Abused [A] has advice on how to prevent triggers. · National Association for People Abused in Childhood [B] has a freephone helpline and has links to local support groups. · Useful post on Triggers [E] from SurvivorsJustice [F] blog. · Jim Hoppers pages on Mindfulness [G] and Meditation [H] may be useful.